For many people, filing for Chapter 7 or Chapter 13 bankruptcy is an effective way to get out from their burdensome debts, and move into the future on surer financial footing. However, it’s important to keep in mind that it may take some strategic thinking and smart actions to really make the most of this new start. In many cases, you may need to be able to present some of these documents in order to be considered for new credit, or to report inaccuracies/make repairs on your credit report over time. In other events, you may need to refer to these important documents if an old creditor attempts to collect on a debt that was discharged. Your credit report is an important way to keep tabs on your financial health, and consumers can access a report from each of the three major credit bureaus once per year. Several months after the discharge of your bankruptcy, you may want to check your credit to see if everything was reported accurately – for instance, to make sure that your discharged debts have indeed been reported to the credit bureaus as a zero balance. If there are any issues or errors, you can dispute the report. From there, keeping an eye on your credit reports over time can help you track how much you’re rebuilding your credit with your post-bankruptcy financial decisions. Bear in mind that everyone’s credit score will be affected by bankruptcy differently. With that said, many people see their scores rebound more quickly than they might have thought possible. And remember that after a reporting period of seven to ten years (depending on the type of bankruptcy you file), the bankruptcy should be dropped from your report altogether. For many individuals, heads of household, wage earners, and retirees, bankruptcy is a way to hit “refresh” on the facets of financial life. It’s an opportunity to ease the pressure associated with severe indebtedness, in order to become a productive and contributing member of the economy once again. With that said, it’s important to make the most of this fresh start – and that generally means making a concerted effort to not fall into debt once again. Remember, before filing for bankruptcy, non-corporate debtors must take a credit counseling course through an approved agency, as well as a financial management course after filing. These courses are required in order to help assure that the debtor understands the bankruptcy process they will be going through, and, just as importantly, to help them learn lessons that will allow them to get their finances on a more sound footing for the move forward after discharge. In addition to managing expenses, many filers often find that managing their savings is a key step forward after the close of the bankruptcy process. After bankruptcy, many consumers still intend to own a home, purchase a vehicle, and fund major life events (like entering retirement, or supporting a child through college). In order to make these dreams a reality, many consumers adopt strict savings plans. This could mean establishing a separate “emergency fund” in order to cover unexpected expenses, from car repairs to medical payments. In addition, many post-bankruptcy consumers look into setting up automatic savings, in order to avoid the temptation to spend and start stockpiling some of their income for the future. After the discharge of bankruptcy, many people want to immediately start taking steps to rebuild their credit and boost their score, as these can be major factors when it comes to buying a home, applying for rentals, or getting loans for major purchases, such as buying a vehicle. In most cases, this is going to mean taking on new credit, so that you can demonstrate your ability to be financially responsible and keep up with payments. However, it’s important to keep in mind that building and maintaining good credit is important – and, as such, it’s not something to be entered into lightly. Many financial experts advise taking it slow when it comes to getting a new credit line, and to start by taking a few sensible, manageable steps. For instance, rather than immediately applying for the highest line possible, many people experience success by choosing an option with a lower credit limit, and making it a point to carefully keep up with the charges and pay their bills each month. In other cases, many people look into other options to start gradually rebuilding their credit, including secured credit cards/lines, or else accepting a “co-signer” on a new card. Above all, it’s important to remember that before, during, and after the bankruptcy process, you don’t have to go it alone. 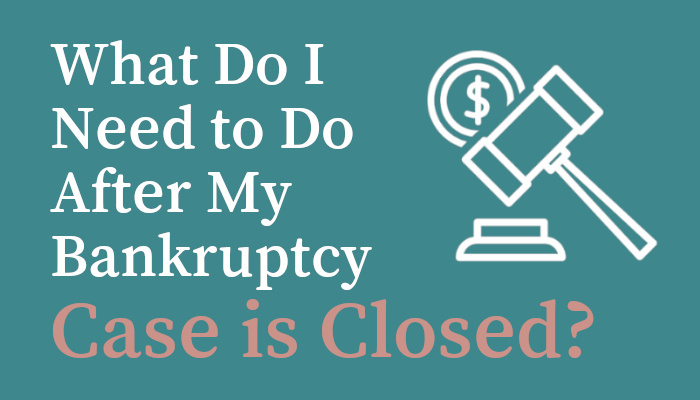 Here in Illinois, there are many moving pieces when it comes to bankruptcy – including understanding what it may take to get started, and, ultimately, how you can best move on after the process has concluded. If you have any further questions or concerns about any aspect of the bankruptcy process – from determining if you qualify, to reestablishing your financial footing after discharge – don’t hesitate to get in touch with the attorneys and staff of the Gunderson Law Firm to continue the conversation. Based in the heart of Chicago, our attorneys and staff have extensive experience in the area of bankruptcy law. Every day, we work to protect our clients’ assets to the highest degree possible under current laws, so that they can get the fresh start they not only need, but genuinely deserve. Drop us a line if you’d like to get in touch or set up a free initial consultation.